loved ones in America’s end-of-life process? This project redesigns existing team communication tools used in hospitals as a way to address miscoordination issues in the American healthcare system. How might all the players in the care ecosystem be responsible and accountable for creating a quality patient experience? We worked with Memorial Sloan Kettering Cancer Center to explore the ways that we can align perspectives within systems of care during the end-of-life process. By introducing a new touchpoint in the service workflow, we can improve the end of life experience for everyone involved. Through our design process, our goal was to investigate the current state of care in the healthcare system when rescue is no longer an option. Within these constraints, how can we ensure that each person in a hospital and hospice care team is accountable for creating a quality patient experience? How can we build a more effective and responsive care ecosystem? From these questions, we established four key principles that would act as criteria to direct our research process: 1) Foster holistic care; 2) Ensure consistency across departments; 3) Establish sticky, simple and clear communication; and 4) Facilitate a contextual understanding of patient condition over time. We created a short film to explore the current state of end-of-life care from the family’s perspective, as well as from the perspective of the hospital staff. We used case studies, semi-structured interviews and ethnographic research to identify key pain points and service gaps in the end-of-life process. From this current state assessment, we scripted and storyboarded a Vietnamese American family’s experience during a family member’s crisis moment, which was adapted from case studies in the book No Place for Dying: Hospitals and the Ideology of Rescue. In the current state scenario, Mr. Nguyen is at a community hospital Intensive Care Unit (ICU) with end stage renal failure. After speaking with the doctor about his condition, the family agrees to the DNR (do not resuscitate) order. The hospital staff arrange for Mr. Nguyen to be transferred to the hospital step down unit the next morning. In the process, the family experiences difficulty explaining their priorities, and understanding the risks associated with the transfer. When Mr. Nguyen stops breathing in the middle of his transfer, his family is shocked and caught unprepared by what has happened. Through this scenario, we demonstrate how a hospital’s focus on efficiency and rescue actually de-centers no-code patients from their own care. As well, it reveals how current protocols and approaches do not leave room for the emotional needs of friends and family. By showing the gaps in one family’s current experience flow, we can better understand, assess, and identify the components needed to create positive systemic change and improve the end-of-life experience. Without a clear goal, providers are left to wonder whether whiteboard use is simply another ‘‘task’’ or really an intervention to improve care. Through primary research and scenario building, we realized that one of the largest pain points in the end-of-life process was the lack of coordination between different care team members during moments of transition (between shift changes, changing wards, transferring institutions, etc.). In response, we began to assess existing protocols and tools used for patient coordination. 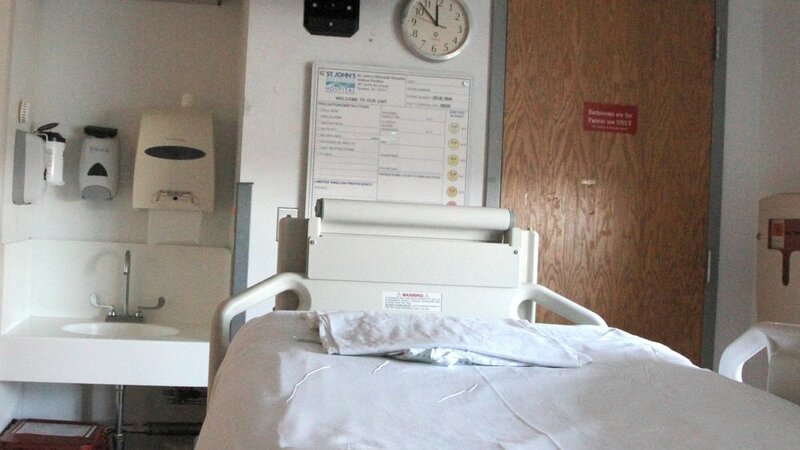 As part of our methodology, we conducted photo studies and shadowed team members in a New York community hospital. We identified patient communication boards as an existing touchpoint where we had the opportunity to intervene. Present both as whiteboards and digital touchscreens, communication boards are commonly used in hospitals by multiple care team members to coordinate information. However, each member’s perspective, practices, and expectations may be different when using the tool. With our aim to place the patient at the center of the process, our research indicated that the board needed to better engage all care team members in actively addressing goals and responsibilities set by the patient and their personal team. In response to these needs and goals, we created a communication tool called The Hive: Dialogue With Your Care Ecosystem. The Hive is a meaningful way for patients to communicate what is important to them, and should be used by all players involved in a person’s care. This includes the physician team, nursing team, personal team of friends and family, and support staff. It is introduced to a patient and their personal team when they are admitted to the hospital. As a communication tool for the care ecosystem, it is designed to live in a long-term care patient’s room, and can be moved from room to room during transfer. 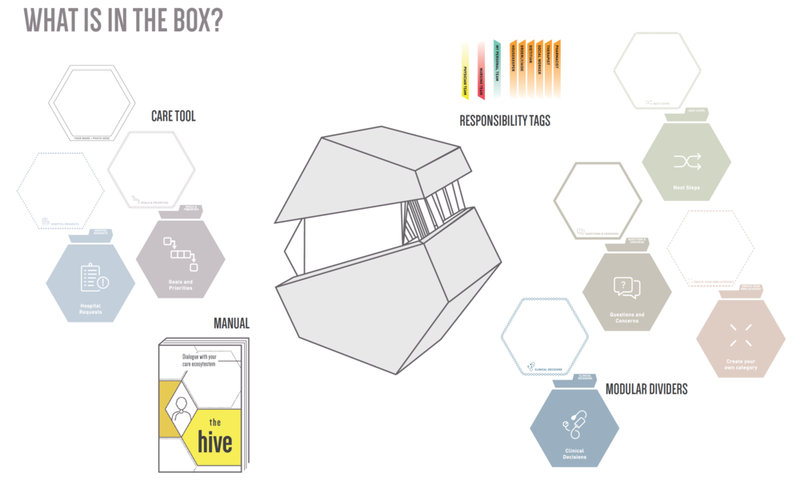 Ultimately, the Hive would have reduced family confusion and created a more inclusive decision making process. If the tool had been in place, the Nguyen family would have been able to request a Vietnamese translator so the mother could have been more engaged in the discussions. The family would have explained their priorities, which included all being together and creating a calm and quiet environment. The nurse also would have felt empowered to discuss the potential risks of Mr. Nguyen’s transfer, and would have helped the family develop questions to ask the doctor. We presented our prototype and service design to the Design and Innovation Group at Memorial Sloan Kettering Cancer Center and are looking into piloting opportunities. We are also investigating digital compatibility, archiving, and multilingual language support as possible avenues for expansion and development. It is our hope that this work can demonstrate the ways in which redesigning existing tools and services can improve the end-of-life process and place patients at the center of their care.